Introduction Reading is one of the language skills that you will study and practice in this textbook. Remember reading is one of the most important activities any successful student does in any course of study. It is important to note that reading is an active process; you need to apply strategies that will enable you make sense of what you read. The chapter aims at making you a good reader; somebody who will be able to monitor your rate of progress as you read and improve your understanding. To do this you will be introduced to a number of strategies or approaches at both surface and deeper levels. There will also be opportunities for you to practice. Specifically, you will be introduced to strategies of reading namely: skimming, scanning, SQ3R, active reading, reading for comprehension. You will also be introduced to resources within a text such as graphics conventions, symbols, layout, punctuation, figures, diagrams, tables, pictures and word roots in sciences. Then the chapter will also discuss some barriers or obstacles to effective reading. • Describe a variety of reading strategies effective readers use as they read a text for comprehension. • Apply a chosen strategy to read an identified passage • Discuss common barriers to effective reading • Suggest ways of solving problems readers experience during their reading activities. • Read any resource efficiently using any of the reading strategies discussed • Read texts critically to help you evaluate the given information. A good way of getting started on developing your reading skills is to think about how you read a text or passage. There are three main reading techniques that you can use: scanning, skimming, and focused reading. Let's discuss each in turn. Scanning5 The technique of scanning is a useful one to use if you want to get an overview of the text you are reading as a whole – its shape, the focus of each section, the topics or key issues that are dealt with, and so on. In order to scan a piece of text you might look for sub- headings or identify key words and phrases which give you clues about its focus. Another useful method is to read the first sentence or two of each paragraph in order to get the general gist of the discussion and the way that it progresses. 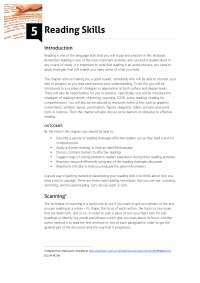 Scanning is used to find a particular piece of information. Run your eyes over the text looking for the specific piece of information you need. Use scanning on schedules, meeting plans, etc. in order to find the specific details you require. If you see words or phrases that you don't understand, don't worry when scanning. Scanning is what you do to find an answer to a specific question. You may run your eyes quickly down the page in a zigzag or winding S pattern. If you are looking for a name, you note capital letters. For a date, you look for numbers. Vocabulary words may be boldfaced or italicized. When you scan for information, you read only what is needed. • Read the first paragraph of the chapter line by line. • Next, read all the bold print headings starting at the beginning. • Read the first sentence of every paragraph. • Study any pictures, graphs, charts, and maps. • Finally, read the last paragraph of the chapter. As you skim, you could write down the main ideas and develop a chapter outline. 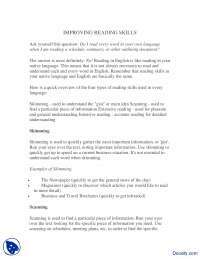 Focused Reading Focused reading employs two sub skills namely extensive and intensive reading. However, the idea is to have an area of emphasis or focus. In other words, it is a purposeful kind of reading, during which you target a specific area of study. Let us examine how the two skills relate to and differ from each other. 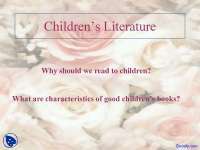 Extensive reading is used to obtain a general understanding of a subject and includes reading longer texts for pleasure, as well as business books. Use extensive reading skills to improve your general knowledge of business procedures. Do not worry if you do not understand each word. Intensive reading is used on shorter texts in order to extract specific information. It includes very close accurate reading for detail. Use intensive reading skills to grasp the details of a specific situation. In this case, it is important that you understand each word, number or fact. 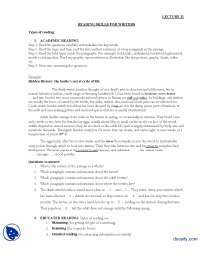 • Explain when and why you would use the skimming technique in the context of your studies here at Bunda. • Who in your seminar group is an effective reader? Discuss and justify your choice. • To what extent is reading an active process? Once you get the skimming, scanning and focussed reading down pat, you are ready to move on to the SQ3R reading method which employs each of these three techniques. the headings to see the major points. 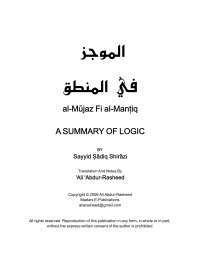 Read the introductory paragraphs and the summary at the end of the chapter. Do not forget to look at the tables, pictures, etc. Remember, you are scanning the material and not actually reading every sentence. Question (Q) Make questions that can be answered during the reading of the material. This will give a purpose to your reading. Take a heading and turn it into a question. For example, if a heading in a chapter about Cell Division is in your biology text, make a question by turning the title around: “How does cell division occur?” or “How many steps are involved in cell division?” Read (R) Now you read the material trying to find answers to your questions. This is a careful reading, line by line. You may want to take notes or make flashcards. Recite (R) As you read, look away from your book and notes and try to answer your questions. This checks your learning and helps put that information in your memory. Review (R) To check your memory, scan portions of the material or your notes to verify your answers. Review the material and note the main points under each heading. This review step helps you retain the material. The SQ3R method is just one technique that can be used to retain information you collect while reading. Students learn in different ways. Therefore they should be aware of their learning styles. Knowing whether you are an Auditory (learn by hearing), Visual (learn by seeing) or Kinaesthetic (hands-on) learner helps you to understand your best learning environment. The SQ3R technique of reading can help to enhance your reading skills no matter what your style is. terms above using the context in which they are used. Also develop a set of questions for further investigation. focused way. Think about each section of the text, breaking off at regular intervals and ... • Extract the main points or examples about climate change in Malawi. • Jot down some notes and questions that come to mind as you read. • Use other reading resources that discuss issues of climate change in Malawi answer the questions you developed in ‘2’ above. Key message 4: Climate change exposes the underlying causes of food insecurity. Droughts and floods are exposing the crisis in livelihoods of smallholder farmers in Malawi. family,” said Selimani Zaina, 79 year old victim of the 2005 drought. Key message 5: Existing local government capacity cannot support the challenges smallholder farmers face in adapting to climate change. has far reaching consequences for its implementation. Explain how you would survey the above Action Aids article? • List down any three questions you would ask as you plan to read it comprehensively. • Give the main points you would recall. • Identify key ideas. • Extract the information you want from the text. • Process that information so that it makes sense to you. One of the graphic organizers is the use of synonyms, antonyms and homonyms which readers use when learning vocabulary in the course of reading any resource. This is done with the understanding that in some ways words are similar in one way or another. To begin with, synonyms are words that mean the same despite having some morphological differences. For example, words like cute/beautiful; huge/gigantic are synonyms. An antonym, on the other hand, is a word that has an opposite meaning of another word. Words such as pretty/ugly; strong/weak; tall/short exposes different meaning and should be used differently. Further, homonyms are words that have similar sounds if pronounced and somebody might hardly recognize their difference if carelessly done so. Think about words like their/there; reach/rich; fit/feet. Reading in this case which has to go with pronunciation has to take care of the possible differences that ought to be there. Note: Synonym is for sameness in meaning Antonym is for an opposite meaning Homonym is a word which can be heard like another word So, from the forgoing, it is observed that words are related in many other ways such that they are alike, different and related to each other. This means that understanding how words relate to each other helps readers to increase their vocabulary, enables them to analyze and synthesize any information they read from any reading resource at any level of study which leads to one’s building of a useful vocabulary. 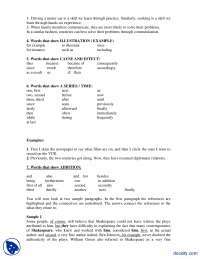 Read the following sentences and identify words or phrases that have similar meanings within the sentences. 2. When phosphate, a pollutant, is emptied into a pond, algae grow very fast. Then when algae flourish, the water supply may be affected. 3. The recent data on students’ performance at Malawi School Certificate of Examination indicate that quality of education in Malawi is going down. The information also indicates that students’ interest in schooling is low. 4. Should politicians regulate the amount of tuition in tertiary institutions? Some academicians do not believe that politicians’ control is the solution to the rising cost of feeding students in colleges. 5. Industrious students usually succeed in their studies. It is evident that all students who worked hard in the previous years are in high positions. • Help students focus on text structure ‘differences between fiction and nonfiction’ as they read. • Provide students with tools they can use to examine and show relationships in a text. Used to order or sequence events within a text. For example, listing the steps for carrying out an experiment. Used to chart the story structure. These can be organized into fiction and nonfiction text structures. For example, defining characters, setting, events, problem, and resolution in a fiction story; however in a nonfiction story, main idea and details would be identified. A chart is a visual representation of data, in which the data are represented by symbols such as bars in a bar chart or lines in a line chart. A chart can represent tabular numeric data, functions or some kinds of qualitative structures. The term "chart" as a visual representation of data has multiple meanings. A data chart is a type of diagram or graph that organizes and represents a set of numerical or qualitative data. The four common charts are histogram, line, bar and pie chart. The following is an example of a pie chart. A histogram typically shows the quantity of points that fall within various numeric ranges (or bins). A bar chart uses bars to show frequencies or values for different categories. A pie chart shows percentage values as a slice of a pie. A line chart is a two-dimensional scatter plot of ordered observations where the observations are connected following their order. Students pre-read the science text to understand its structure and the scope of its content. By consciously analyzing and recording the author’s outline and advance organizers, students are better prepared to understand the text when they read it. A mind map is a diagram used to represent words, ideas, tasks, or other items linked to and arranged around a central key word or idea. Mind maps are used to generate, visualize, structure, and classify ideas, and as an aid in study, organization, problem solving, decision making, and writing. The elements of a given mind map are arranged intuitively according to the importance of the concepts, and are classified into groupings, branches, or areas, with the goal of representing semantic or other connections between portions of information. Mind maps may also aid recall of existing memories of what is read9. A concept map is a way of representing relations between ideas, images or words, in the same way that a sentence diagram represents the grammar of a sentence, a road map represents the locations of highways and towns http://en.wikipedia.org/wiki/Concept. They are graphical tools for organizing and representing knowledge. Concepts, usually represented as boxes or circles, are connected with labelled arrows in a downward- branching hierarchical structure. The relationship between concepts can be articulated in linking phrases such as "gives rise to", "results in", "is required by," or "contributes to". The technique for visualizing these relationships among different concepts is called "Concept mapping"10. A KWL table, or KWL chart, is a graphical organizer designed to help in learning. The letters KWL are an acronym for "what we know", what we want to know, and "what we learned". A KWL table is typically divided into three columns titled Know, Want and Learned. The table comes in various forms as some have modified it to include or exclude information. It may be useful in research projects and to organize information to help study for tests. The chart is a comprehension strategy used to activate background knowledge prior to reading and is completely student centred. The teacher divides a piece of chart paper into three columns. The first column, 'K', is for what the students already know about a topic. This step is to be completed before the reading. The next column, 'W', is for students to list what they want to learn about the topic during the reading. This step is also to be completed before the reading. The third column, 'L', is for what the students learned from the reading. This step, of course, is done after finishing the reading. The KWL chart can also be used in reading instruction at the beginning of a new unit. students learned in this space. A KWL chart can be used to drive instruction in the classroom. The teacher can create lesson plans based upon. KWL chart activates students' prior knowledge of the text or topic to be studied. By asking students what they already know, students are thinking about prior experiences or knowledge about the topic. Next, KWL charts set a purpose for the unit. Students are able to add their input to the topic by asking them what they want to know. Students then have a purpose for participating and engaging in the topic. Also, using a KWL chart allows students to expand their ideas beyond the text used in the classroom11. Students learn how to construct and decipher scientific words by understanding the meanings of roots, prefixes and suffixes common to biology, chemistry, physics, and the earth and space sciences. This is a reading activity in which a passage has some missing words for the reader to fill in either before or after reading. The activity is used to assess the readability of a passage. The higher the cloze scores for a given population, the more readable the passage. In this chapter we introduce cloze as a technique for developing and assessing reading comprehension. Jigsaw is a technique whereby students develop reading skills by dialoguing with others, preparing notes, and teaching their peers. Initially, students are given some reading texts to master and in this case each student becomes an expert of his/her text. After mastery is when then they share with others either in pairs or groups. It is a best method because it promotes a 100% participation in the reading task. The word cognate derives from Latin cognatus "blood relative". In linguistics, they are words that have a common etymological origin. An example of cognates within the same language would be English shirt and skirt, the former from Old English scyrte, the latter loaned from Old Norse skyrta, both from the same Common Germanic *skurtjōn-. Words with this type of relationship within a single language are called doublets. Further cognates of the same word in other Germanic languages would include German Schürze and Dutch schort "apron". Cognates need not have the same meaning: dish (English) and Tisch ("table", German) and desco ("table", medieval Italian), or starve (English) and sterben ("die", German), or head (English) and chef ("chief, head", French), serve as examples as to how cognate terms may diverge in meaning as languages develop separately, eventually becoming false friends. The understanding of this relationship helps readers of texts to know word meanings easily by referring to other words with similar structures12. Cause: You are out of fuel. Effect: Your car won't start. Sometimes, many causes contribute to a single effect or many effects may result from a single cause13. The comprehension of language includes linguistic knowledge, background knowledge, making inferences, and the self-regulation of comprehension (or meta cognition). Comprehension of a text is reliant on an individual’s knowledge of the language system. We build up this knowledge with repeated exposure to how language is used. As we interact with the language so we begin to understand certain nuances. A language system is made up of phonology, semantics (this includes word meanings and also morphology), and its grammatical structure. For example phonology is about how a language sounds and how sounds are used to communicate differences in meaning. Semantic knowledge looks at the various meanings of words, phrases or sentences that allow us to comprehend knowledge. In order to improve your linguistic knowledge you need to read widely and be exposed to words and meanings in varying contexts. In addition, word study and instruction that includes orthography, morphology and spelling can strengthen your vocabulary learning. We are constantly building our background knowledge. By the end of your secondary school education you have already amassed background knowledge of the world and its social and cultural contexts. Continued reading and reading broadly will grow this knowledge further. Comprehension beyond the word level requires the reader not only to activate background knowledge but also integrate meaning across sentences. As the message becomes less familiar, the reader needs to make inferences. Readers need to actively construct a mental model of the text that draws upon the text and their own background knowledge. This is sometimes called active construction of meaning from text whereby we need to infer the meaning. To be a good reader one needs to reflect and evaluate your understanding of what you have read. Self-regulated comprehension involves activating knowledge, making predictions about meaning, reflecting on what has been understood, and if necessary drawing new conclusions about your understanding. Readers need sufficient background knowledge to be able to understand what they read. An effective reader engages actively with the text. There should be a swopping of ideas between the reader and the text, or the speaker and the listener. This is called a transaction. The transaction enables readers to negotiate the meanings of the texts they read. Transactions increase motivation and can further develop comprehension. 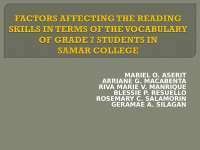 One of the ways of understanding the content of a subject through reading is to know the appropriate meaning of words used in a text. Words are used to communicate ideas. There are two types of words: content and functional words. Content words usually contain ideas, concepts and the latter, links words for clarity following grammar of a particular medium of instruction. Words also have denotative and connotative meanings: a literal or intended meaning like in the example, ‘She is a star’, meaning she is one of the heavenly bodies and an evaluative or deeper meaning she performs well. Summary In this chapter you have learnt that reading is an active process through which you understand the writer’s meaning. Readers use a variety of reading skills to enhance their understanding of the reading resource. Careful readers apply a number of strategies to decipher the meaning of any new vocabulary whether functional or content word. However, as we read we may display or face a number of obstacles or barriers which affect our uptake of the text. However, care must be taken each time we read in order to understand the read materials. This chapter has discussed several ways you could use to learn new words. Explain any five ways you could learn new vocabulary in your science courses. 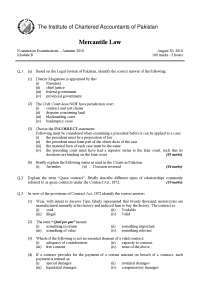 Give an example in each case. Edwards, A.W.F. (2004). Cogwheels of the Mind: the story of Venn diagrams, Johns Hopkins University Press, Baltimore and London. Extensive reading Extensive reading is used to obtain a general understanding of a subject and includes reading longer texts for pleasure, as well as business books. Graphic organizers Word relationships which uses of synonyms, antonyms and homonyms which readers use when learning vocabulary in the course of reading any resource.